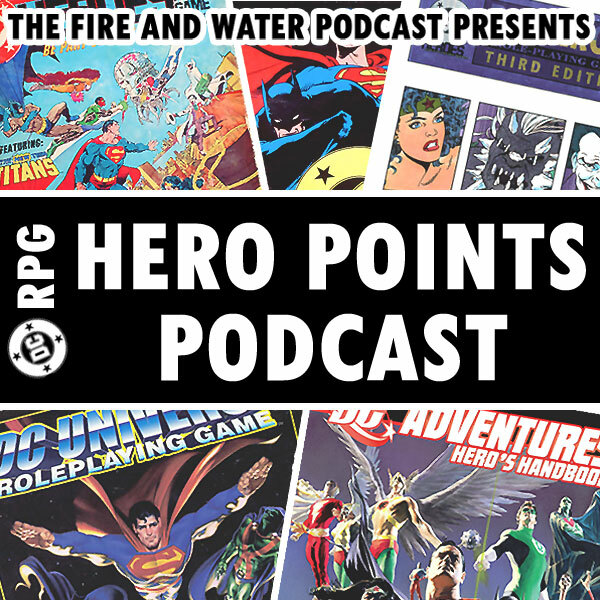 The second episode of our HERO POINTS podcast is now available — the show that tackles role-playing games set in the DC Universe! This time around Shag and Siskoid chat about The Atlas of the DC Universe, from Mayfair Games released in 1990. First, we interview comics legend and author of the Atlas, Paul Kupperberg. Then, we provide an overview of the Atlas pointing out some favorite bits. Finally, we wrap up the show with your Listener Feedback! Find the second episode of DC RPG: THE HERO POINTS PODCAST on iTunes. Each episode is released as part of THE FIRE AND WATER PODCAST feed. While you’re on iTunes, please drop us a review. Alternatively, you may download the podcast by right-clicking here, choosing “Save Target/Link As”, and selecting a location on your computer to save the file (55 MB). Just to whet your appetite, here is a map of the United States indicating where all the fictitious cities are in the DCU! Click the image to enlarge. For lots more pages from this book, be sure to check out our Tumblr site: FireAndWaterPodcast.Tumblr.com! Posted in: Hero Points Podcast, Interview, Podcast, RPGs. ← BREAKING NEWS! Professor Martin Stein Coming to CW’s The Flash! Good show, guys. One of the best episodes of Hero Points so far–definitely Top 5! With all due respect to Paris Cullins, I can’t suspend my disbelief or shrug off this cover. The shadow on the Earth, that ain’t how light and shadow works. The thing about Earth revolving around the Sun is that half of the Earth is always in shadow. Half, not twenty to thirty percent. The only way that shadow of the Americas would exist is if our solar system had a second son on the other side of Mars, and if we had a larger moon between us and Sun Number 2. But this second moon would have to be pretty oddly shaped in order to cast a shadow only on the Gulf of Mexico and part of the Pacific Ocean but not darken the terrain of North and South America. Seriously, Cullins, take another pass at this one. On the other hand, I like the stylized effect of the Kirby Crackle, despite it giving everyone in Asia the powers of the Fantastic Four. Or, given the geography, I suppose the powers of Red Ghost and the Super-Apes. Top 5? I dare say Top 2! 😉 The Kupperberg interview takes it up a notch. About the cover, I didn’t mention it, but it’s another example of Canada getting fudged. What happened to everything east of Hudson Bay? Did it go the way of Melbourne in the Invasion? Another great episode! Definitely brings me back! And yes, feel free to call me old for using the term ‘snail mail’. That’s what it was back then! I don’t have this book but now I feel like I need to find it. As a Supergirl fan, I was a bit sad to see that Midvale, the town Supergirl had her earliest adventures, was left out of the book. How do the ‘Dial H’ people warrant coverage! Any mention of Supergirl in the Chicago section as she was the hero there under Paul Kupperberg. Of course this being post-crisis, I suppose any mention of Supergirl was forbidden. I actually just started rereading the Denny Oneil Question comic so there is a weird synchronicity to hear you guys talk about Hub City. As a big Legion guy, the Universe section does sound cool. All the more reason for me to look for it. But the big win is a Krypton section! Thanks for posting it. Did you see Jor-El’s stats? He has an unreal 110 hero points! Dude is a playah! Metropolis is going to pick up even more geographical issues when some versions decide that it needs to be the nearest big city to Smallville, which creates some serious issues with it also being an East Cost port. Right, the one where the Bug switches brains with Superman destroys the waterfront. As for the Doom Patrol team, it would be wrong to accuse Ambush Bug of that destruction. Qurac is on the Arabian Peninsula’s east coast in the book. Kuwait and Abu Dhabi are marked within its borders. So, what, they’re provinces of Quraq? Or was that just explicitly saying what’s being overwritten? The text explicitly mentions Kuwait as a city in Qurac, so yes, it’s “eaten” a whole country. Three actually, Bahrain and Qatar too, and a good chunk of the Emirates (just short of Dubai). No other countries in the book are as large, and are usually squeezed in between the borders of better known countries. Great episode guys. The Atlas is amongst those Mayfair books that still sit on my bookshelf. I do recall scratching my head about both Metropolis and Gotham being in Delaware and New Jersey, though. In hindsight it makes sense, but at the time I thought New York should just be a bigger state in the DCU. Of course, I’ve heard Metropolis compared to Chicago, and Joe Shuster based Superman’s hometown on his then current residence of Cleveland, Ohio, so who knows? I did find it fascinating to find out the back stories of the lesser known towns in the DCU, like Ivytown, Blue Valley, etc. Made the world, and the universe, just seem that much more real and alive. The interview with Paul Kupperberg was a blast. I’m sure researching the book was a mind-numbing experience. Bringing in obscure things like “The Silver Twist” you mentioned, shows how deep he dug for info. I’m not certain, but I’d guess that weird space phenomenon (that does indeed sound a lot like The Nexus from Star Trek: Generations) came from the later O’Neil/Grell/Sauviak run of Green Lantern/Green Arrow, which was a straight super hero book. Count D: That sounds like the Fire & Water slogan. Chris: You’ll find the Twist in Green Lantern Vol. 2 #92 (December 1976-January 1977). I mentioned this on the FWP blog, but I believe that cut-off Zandia entry was supposed to end along the lines of “…centuries-long curse was finally broken).” — if that helps. The Silver Twist also appeared in Green Lantern v2 #110. Tne interesting thing about the Silver Twist phenomenon (doo doo dee doo doo) that was not mentioned in the Atlas is that the dimensions Green Lantern and Green Arrow travelled to seemed to be keyed to one of the traveller’s subconscious in some way. This was to explain why they ended up in a Robin-Hood-type of scenario in Green Lantern v2 #92 (Ollie’s influence) and a John-Wayne-Western-like scenario in Green Lantern v2 #110 (Hal’s influence). And Darkseid saying “Silver Twist” made my day. Thank you. Should we just go ahead and call it DC RPG: The Hero Points Podcast Annual 2014? My copy of the Atlas was badly water damaged in a longbox several years ago, from the upper third of the spine out several inches, but it’s still readable. I keep it handy on the bookshelf next to my desk, just ahead of where my Showcase Presents/Marvel Essentials start to roll out. My Martian Manhunter Showcases would make it a shelf & a half worth of that lot, but they’re never actually on the shelf because I use them so much. Nice interview! I can see the work done here more fully thanks to the podcast overview. I never noticed/appreciated the breakdown of industry/sports/etc. Middleton, CO is the established home base of Dr. Saul Erdel in the Post-Crisis revision of the Martian Manhunter. However, there’s some debate about where Middletown, home of Professor Mark Erdel and Detective John Jones’ Silver Age adventures was located. Scipio Garling thinks it’s Florida, but he also redubbed Middletown “Apex City” on a personal whim, so I dispute that. Personally, I favor the region surrounding New England, which is lousy with Middletowns. Given its presumed proximity to Gotham City, it could also be one of the ones in New York or New Jersey. Speaking of “Apex,” as with all DC Comics reference works, no one ever bothered to look at old Martian Manhunter stories to note all the references to Apex companies in his strip. Neither is Middletown’s local baseball team, though it isn’t clear whether they’re the Flamingos or the Wonders. Some reg’lar folks from the Atlas not referenced in the podcast include stats for Ray Palmer’s buddy Norman Brawler and wife Jean Loring, as well as Captain Atom’s science chief Dr. Megala and Metal Men creator Dr. Will Magnus. Jack Ryder, Vic Sage and Wayne Tarrant are all under public figures. Diablo Island is my favorite international location, followed by Gorilla City. Two hours is a long podcast, but still, any time I tuned out for half a minute you guys had already jumped a dozen pages. So far, now that I’ve got my own weekly podcast, nobody’s tried to “take the mickey” out of me. So much for the concept of karma, eh? As a one time conceptual art effort, I’d be willing to try a Skype session. Sounds like a scheduling nightmare, though. Shag, for the love of god, double “L”s in Spanish words/names are pronounced as “Y”s. Holy crap that Charlton Arrow series sounds awesome! Doomsday +1 Pin-up by John Byrne?!?!?! Consider that bad boy purchased!! Great interview with Mr. Kupperberg! Super nice guy! I bought some stuff from him off of ebay a couple of months back and he was happy to sign and personalize some of the books for me that he had worked on. Interesting to hear all of the cities in Iowa that are referenced, over in the Marvel Universe my hometown of Waverly, IA, a present day booming metropolis of 11,000 people or so is the birthplace of Hawkeye! How many of you can say you share a hometown with an Avenger?! I always felt like the way they portrayed Metropolis, it was New York City during the day, while Gotham tended to be New York at night. I could also see Gotham City as being in Chicago, with all of the organized crime. There is quite a bit of shipping that goes on in the great lakes, so Chicago being on Lake Michigan would still work. I’m sure one of the other comments from listeners touched on this, but I’m guessing that the “Star Gate” was used in comics over “Boom Tube” via one (or all) of the three volumes of the Super Powers comic mini series that DC put out. One of those was written by Kupperberg, so it’d make sense that he went ahead and tied them together once and for all here in this RPG sourcebook. 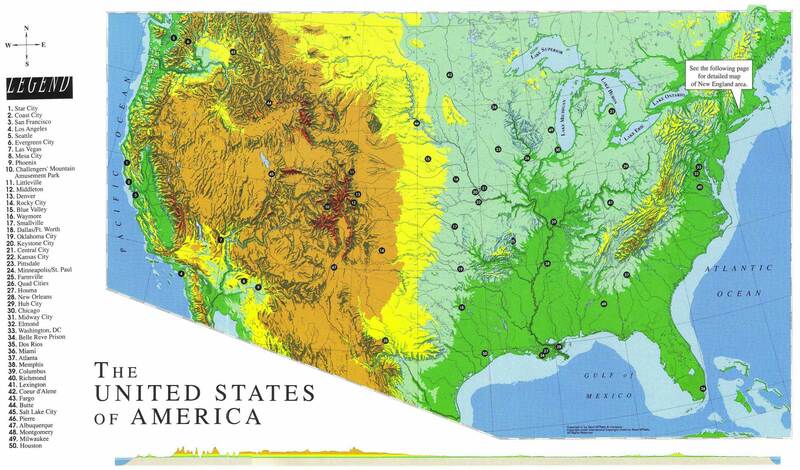 I have always wanted to own this Atlas but have never gotten around to picking it up…I really need to get on that. Can’t wait to hear what you guys cover next. You don’t my any chance have any Title/Issue #s for references to either team, do you? Never mind. I found 2 references on your blog to Detective Comics #226. Thanks! The Atlas certainly doesn’t contain any references like that, but several sourcebooks made later do! As for the Middletown baseball team, the AotDCU says that Middleton incorporated with Denver in 1968. My guess is that this means Middleton would have become a suburb or township of Denver. This would mean that the Flamingos (or Wonders) would have been replaced by the new Denver MLB expansion team, the Colorado Rockies, in 1993. Either that or Denver supported 2 MLB franchises like NY (Mets/Yankees), though that seems unlikely given the population differences.